VoiceOver, the screenreader included with Mac OS X, ships with several voices. In addition to changing the voice used by VoiceOver, you can use the VoiceOver Utility to adjust other settings such as the speaking rate, pitch and intonation. 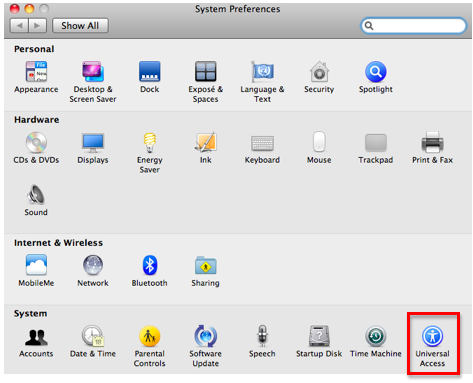 Choose Apple, System Preferences, Universal Access. In the Seeing Tab, choose Open VoiceOver Utility. Select the Speech category on the left side of the window, then select the Voices pane. Use the controls in the Voices pane to select a voice and adjust the speaking rate, pitch, volume and intonation. 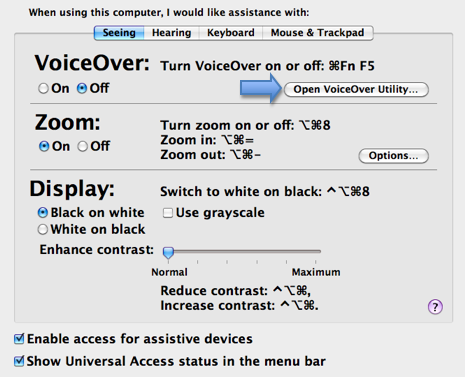 The VoiceOver voice settings can be quickly changed using just the keyboard. To do this, press Control, Option, Command and the Right Arrow key while VoiceOver is running, then use the Left and Right Arrow keys to navigate the different voice settings. To change the value of any setting, press the Up or Down Arrow keys on your keyboard. How do I add people to my Buddy List in iChat? How do I block users I don’t want to chat with me on iChat? How do I change my buddy icon in iChat? How do I change my online status in iChat? How do I chat with more than one buddy at a time with iChat? How do I send a file using iChat? How do I set up iChat? How do I start a a chat in iChat? I have an iSight camera, but my friend doesn’t, can I still do a video chat? What are emoticons, and how do I use them in iChat? What do all those abbreviations used in chat mean? What do I need to install in order to get started with chat? How do I encourage my students to stay on task while using the computer? How do I ensure that my students take good care of the computers we have in our classroom? How do I minimize disruptions due to technical problems? How do I promote collaborative learning using the computers in my classroom? I only have one computer, how do I implement technology in my classroom? How do I add a link to a webpage in my message? How do I check my mailbox for new messages? How do I control “spam”? How do I create a signature to appear at the end of my emails? How do I create an email list? How do I hide the names of my mailing list recipients? How do I know who is really sending me an email? How do I reply to or forward an email? How do I save a file sent to me? How do I set up my email account in Mail? What are rules, and how do I use them to manage my email? What is “phishing” and how do I protect myself from it? What is an attachment, and how do I send one? What is good email Netiquette? Can I open files created with a PC on my Mac? How do I assign labels to my folders? How do I change the program that opens a type of file on my computer? How do I compress files to make them smaller? How do I connect two Macs to share files using a Firewire cable? How do I create a copy of a file? How do I delete files or folders? How do I find out how much disk space I have free to store files on my computer? How do I install programs on my computer? How do I rename a file or folder? How do I save my work on a Mac? How do I share files between Macs and PCs over a network? How do I share files between Macs over the network? How do I switch between open applications using my keyboard? How do I use the Finder to manage my files and folders? How do I view the properties of a file or folder? What is an alias, and how do I create one? What is Spotlight, and how do I use it to search for files on my computer? What is the Dock, and how do I use it? How can I clean my computer? How do I burn a CD on my Mac? How do I change the default printer? How do I connect a digital camera to my computer to download pictures of my students? How do I connect my computer to my school’s network? How do I connect my laptop to a projector? How do I create a computer-to-computer wireless network? How do I install a printer on my Mac? How do I manage print jobs on my Mac? How do I print in landscape? How do I print in on the Mac? How do I safely remove a USB device from my computer? How do I share a printer? I can’t connect to my network, what should I do? I can’t print, what should I do? What is a flash drive? How do I get images on my computer? How do I reduce the file size of an image? How do I use Flickr to create online presentations? How many megapixels do I need my camera to have? What are some tips for taking better pictures? What are the differences between the file formats used to save images? What is the difference between bitmap and vector images? What is the difference between optical and digital zoom? What resolution should I use when I scan my images? What is the World Wide Web? How do I use my web browser to navigate the Web? What is a 404 error and what should I do if I get one? What is a plugin? How do I install it? How do I empty my browser’s cache? What is tabbed browsing, and how do I use it? How should my students cite a web page? How do I create a webpage? How is writing for the web different? How do I make my web pages accessible? What is blogging and how can I use it as a classroom activity? How do I use online map services? What is a podcast and how do I create one? What is an Acceptable Use Policy (AUP)? How do I connect to the Web? How do I control all those pop-up windows? How do I bookmark a site I like so I can view it later? How can I share bookmarks with my students? How can I use a search engine to find the sites I want instead of ten thousand sites I don’t want? How can my students know if a web source is reliable? How can I check to see what sites my students have been visiting? How can I save a local copy of a website to show to my students in a room with no Internet connection? How do I back up my photos using Picasa? How do I build a web gallery using Picasa? How do I capture video from my video camera using Windows Movie Maker? How do I create a movie in Windows Movie Maker? How do I create a slideshow using Picasa? How do I create a web album in Picasa? How do I crop images using Picasa? How do I edit audio with Windows Movie Maker? How do I edit video clips with Windows Movie Maker? How do I email pictures using Picasa? How do I fix the colors in my images using Picasa? How do I import content into Windows Movie Maker? How do I import photos from my digital camera using Picasa? How do I narrate a movie with Windows Movie Maker? How do I order prints using Picasa? How do I print my pictures using Picasa? How do I remove red eye from my images using Picasa? How do I search in Picasa? How do I straighten an image using Picasa? How do I turn a color image into a black and white image with Picasa? How do I use Picasa to manage my photo collection? What are the main parts of the Picasa interface? What is Picasa and how do I install it on my computer? What is Windows Movie Maker? How do I add people to my contact list in Windows Messenger? How do I block users I don’t want to chat with me with Windows Messenger? How do I change my online status with Windows Messenger? How do I chat with more than one buddy at a time with Windows Messenger? How do I send a file using Windows Messenger? How do I set up Windows Messenger? How do I start a text chat in Windows Messenger? How do I start a Video Chat in Windows Messenger? How do I start a voice chat in Windows Messenger? How do I use the whiteboard feature in Windows Messenger? What are emoticons, and how do I use them in Windows Messenger? Can I open files created with a Mac on my Windows computer? How can I backup my files? How do I connect to a shared folder on the network? How do I create a shared folder that I can use to share files with my students? How do I delete files in Windows? How do I find out how much space I have free to store files on my computer? How do I install and uninstall programs on my computer? How do I protect my data from viruses? How do I rename a file in Windows? How do I save my work in Windows? How do I search for a file on my computer? How do I share files between Windows and Mac computers? How do I use Windows Explorer to manage my files and folders? What is a shortcut, and how do I create one? What is the proper way to name a file in Windows? How do I protect my computer while using email? What do I need to install to use email? How can I clean up my hard drive to create more space? How do I burn a CD in Windows XP ? How do I connect to a printer on my school’s network? How do I install a printer in Windows XP? How do I manage print jobs in Windows XP? How do I print in Windows XP? How do I scan my hard drive for errors? What is defragmenting and how do I do it? What is system restore and how do I use it? How do I keep my computer secure while surfing the Web? What is spyware and how do I get rid of it? Tech-Ease is your source for just-in-time answers for classroom technology questions. Funding for Tech-Ease content development has been provided by by various grants from the University of South Florida and the Florida Department of Education. Copyright ©2018 by the Florida Center for Instructional Technology, College of Education, University of South Florida.